Apparently the roads to both Hell and Marvel’s Civil War are paved with good intentions…This collection pulls issues from several comics to tell essentially three stories that lay the groundwork for the upcoming conflict. The first shows a previously unknown piece of Marvel history in which the Kree/Skrull War that nearly destroyed Earth so rattled Tony Stark that he gathered a small group of influential figures to convince them that the superheros and mutants need to organize and join forces to prevent those kinds of events. When that idea doesn’t fly they instead form a cabal to share information and address problems like the Hulk’s rampages, and just to make this a dream come true for those who love conspiracy theories this group is known as the Illuminati. The second story features the Fantastic Four battling Doctor Doom who thinks he can take Mjolnir after Thor has died. (Or at least died as much as anyone ever does in a comic book.) The final piece involves Stark recruiting Peter Parker to work as his aide when Tony has to testify in front of congress about the idea of superhero registration, and Tony provides him with a souped-up Spidey suit as part of the deal.Because this is a prelude to Civil War there’s not a lot of resolution in this, but it does provide some solid build-up for what comes next. The stuff with the Illuminati does a lot to explain Tony’s fears and concerns that drive him to his conclusions, and the issues with Spider-Man, who’d prove a pivotal figure in the story later, really establishes the idea that Tony is willing to pull some seriously shady stuff when he’s convinced he’s right and the stakes are this high. The FF story is OK as a punch-em-up with Doom is at his bombastic best, but that piece seems a bit thin. Overall, it makes for a decent prelude to Civil War, but it feels a bit padded. A little back story on some things that happened before the Civil War started. You also get a glimpse of what happened prior to the Planet Hulk story, if anyone is interested. Hmmm. All in all, you could skip it and not be out of the loop. However, it does paint Tony Stark in a questionable light toward the end, so maybe that alone would be worth reading this one. The new Captain America movie looks awesome and since all I read these days are comic books and graphic novels... yeah. why not travel down the Civil War story arc! ?I promise I'll try to read books without pictures next year. Thanks for indulging me these last few weeks. I don't think I've lost any friends along the way...And Merry Christmas you guys. Hope it was awesome. Anyone seeing Star Wars for a second time this weekend?Time to go dubsmash....!! KAPOW! The idea of this trade is to lay out the groundwork for the events of Civil War. It does this through three separate storylines. The first is the single issue Illuminati, which has the strongest writing in the collection. The idea is that some of the most influential voices in Marvel's superhero communities have been secretly meeting for years. The second storyline is a two-issue Fantastic Four thread that honestly didn't do much for me. Not a FF fan. Finally, there's a three-issue Spider-Man story that does the best job of laying the groundwork for Civil War. For those who haven't been reading Marvel for awhile *raises hand* it'll also get you familiar with the idea of a Spider-Man who is very much under Tony Stark's thumb. Not really required for understanding Civil War, but certainly helpful. The FF issues aside, the writing is pretty solid. OK, so I've signed up for Marvel Unlimited mainly to read the Civil War story arc, but I can only imagine that I'll get sucked into even more once I'm done. (If you haven't heard the news, Tony Stark will be in Captain America 3, which many are speculating will tie neatly into the Civil War theme, if not directly to the ideas here.This was a decent starting point, and honestly my first real foray into superhero comics. I'm a fan of graphic novels, but so far have only read things like Watchmen, The Walking Dead, Saga, and Rat Queens.I'm still a little confused because this is such a smorgasbord of everything. Holy interconnectedness, Batman! . Comic Book Herald has been a great help in trying to parse it, but even this TP had the Fantastic Four, Iron Man, Spiderman, Thor, Dr. Doom, and a whole bunch of others I barely recognized.This had a lot more talking than I had anticipated, but as a result was also deeper into the politics and philosophy than I could have hoped for. There's lots of food for thought on the subjects of freedom, government, institutions, registrations, and much more in this volume. I've a sudden appreciation for Marvel that I didn't quite get from the movies alone.All in all, I'm loving this, and forwards we go! If you'll follow that link up above, you can see I have a lot of reading ahead of me. Not sure if I'll get burnt out, but right now I'm enjoying this so far. I guess I took something away from this...? New Avengers: Illuminati: This artwork was really unappealing and this all-male group of superheroes including Iron Man, Black Bolt, Mr. Fantastic, Namor, Dr. Strange, Black Panther, and Professor Xavier basically tried to form a superhero version of the UN and that was voted down and they fought because none of them can get along. Fantastic Four #536-537: So Thor's hammer has landed on Earth after Ragnarok and the FF are called there when Doom shows up with his Doombots and tries to pick up Thor's hammer (view spoiler)[ which he obviously can't do, by the way(hide spoiler)]. Not much to see here, but at least the art's better and there are some jokes. Amazing Spider-Man #529-531: Tony is still a little skeezy in this. You get to see how Tony is manipulating Peter into cahoots with him for the start of Civil War and SHRA enforcement, but you can also see Peter forming doubts about Tony's character and intentions. Artwork was alright and Peter's a good character, so that was a redeeming quality. This ends with the Stamford disaster.Overall, this was not exactly a valuable comic in the Civil War story. I would not really recommend this to anyone unfortunately. This wasn't enjoyable, but I'm glad that I got a little background on the atmosphere prior to Civil War events. My library got a LOT of Marvel's Civil War books, so I thought I'd start it off right.Brian Michael Bendis and Alex Maleev's New Avengers: Illuminati is a good continuity-steeped, talking-heads superhero book. Straczynski and McKone's Fantastic Four story has a nice return for Dr. Doom (he literally comes back from hell), but feels mostly like it's introducing a chess piece in the return of Thor's enchanted hammer. Straczynski and Garney's Spider-Man story tries to show off all the moral complexities in the Civil War books, but is mostly talking heads again. Spider-man also gets his "iron spider" costume; it's hard to explain why they changed such a recognizable costume.All in all, I'm somewhat disappointed with how Civil War's starting. [Re-read after half a decade]A glimpse into the events that would one day lead to a massive rift between superheroes. Friends and families stood on opposite sides when the line got drawn. Tony Stark does what he thinks is best for humanity without acknowledging repercussions of his own actions. House of M gets mentioned (in which Scarlett Witch messes with reality) and Hulk's destruction of Vegas. These two become triggering factors to half of the public that is weary of collateral damages induced by Superheroes. Good start to a promising arc. Iron Man and Mister Fantastic are assholes...way more than in the movies. They shoot Hulk into space, manipulate Spider-Man, and keep secrets from everyone "for their own good". I can see no reason why anyone would side with them at all, other than that I really liked it. The act that pushes the government into passing the Superhero Registration Act makes a whole lot more sense and is much more horrifying than the one in the movie also. I loved the beginning of the Civil War series. I forgot how much I loved some of these characters, especially The Thing. I'm interested to see what happens next. I have all of the comic books in the series, and will probably binge read them tonight, before I have to return them to the library tomorrow. The most important part of this book is that Doom is the real MVP (and got trolled by Thor's hammer). Pues sin ser un lector asiduo de novelas gráficas y menos de superhéroes, tengo que reconocer que he redescubrierto el género e intuyo la futura lectura de unos cuantos de estos. While working my way through the Marvel events, I found that each usually has some kind of prelude, or road to set-up book that collects some issues to help orient the reader to what’s coming. They set the stage. Of the few I've read so far, this is the best set-up collection I've seen.I’m familiar with the basic premise of the Civil War event, but am just now starting to read the graphic novel collections. The most important aspect of this book is the Illuminati one shot. 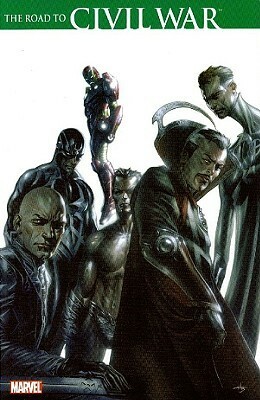 The greatest superhero geniuses (with one glaring omission, but he has anger management issues) have gathered and decided that they will meet in secret to try and determine a course of action should future Earth-level disasters emerge – the idea is to use their collective brilliance to help prevent events such as the Kree-Skrull war from devastating Earth. Only Black Panther is wise enough to see that this group has no right to set itself as Earth’s Protectors, and warns of what would happen should they disagree on a course of action. This bears out when Iron Man, after learning about the proposed Superhero Registration Act, envisions with perfect clarity just how “Civil War” would unfold. He literally prophesies what is to come, and so believes the group should embrace the Act. Black Panther’s warning becomes reality when Dr. Strange declares that they would be giving in to fear and ignorance and many of their peers would fight to the death to protect their rights. The group is at odds and the stage set. (An interesting side note is the Professor X has not been seen since the House of M failed).After the one shot, a brief story wherein Dr. Doom tries to claim Mjolnir in the wake of the Asgardians’ final deaths in Ragnarok follows. I’m sure the hammer will play a role in the coming story arc, despite Thor’s absence. The rest of the collection is devoted to Tony Stark grooming Peter Parker as a protégé, giving him new armor and taking him to Congressional meetings where he tries to “dissuade” them from passing the Act. Only, is that really his agenda?Overall, this was an excellent collection of issues that does set the stage for Civil War. Highly recommended. I had heard about the Marvel Civil War story arc when it was being first published. The concept was interesting and I was curious. When I saw this book at the library, I thought it would be a good way to get started into it. I was already familiar with what happens during the Civil War and which super heroes were on which side. This is graphic novel is a good way to lead into the story arc.This novel is comprised from three comic lines:New Avengers Illuminati Special: Issue 1Fantastic Four: Issues 536 and 537Amazing Spider-Man: Issues 529 to 531The first story is really good. It helps to tie events from the past into the Civil War. You can see how the events in the Fantastic Four issues tie in shortly after the New Avengers comic. However, you can't see how it will tie into the Civil War. Finally, the Spider Man issues lay the ground work for the Superhuman Registration Act and ends with the events that start off the the Civil War.While reading it, you sense the foreboding events that lead to the Civil War. This sense, helps to get you interested in reading the actual Civil War stories. However, the low point is the Fantastic Four issues, as you can't figure how it will play into the Civil War. That's not to say it's bad, but feels out of place. Perhaps reading the Civil War issues will clear that up.Overall, if you are planning on reading the Civil War stories, then this is a good way to get started. On the other side, if you are not interested in it, then you can skip this. Not a big comic reader so I came into this expecting a nice set up to the Civil War crossover event. After reading it I would say that it isn't necessary to read this book before getting into the Civil War arc, although doing so will give you some interesting back story. It is very jumbled in the sense that it includes randomly related (more like semi-related) issues of various comics that help shape the beginning of this event. Overall however it serves its purpose and gives you a good sense of what's happening/has happened to some of the bigger heroes like Iron Man and Spider-Man who are more involved in the big event. Not too bad.- V.
Well, I had never had the opportunity before now to read all of the Civil War storyline, so all of the issues in this were new to me. It collects: New Avengers: Illuminati; Amazing Spider-Man (vol. 1) #529-531, and Fantastic Four #536-537. The stories are interesting but even though I kind of know how this story goes I find some of it a bit puzzling. As a collection it doesn't hold up that great, because the issues aren't directly related to each other. I guess at some point down the line it will be obvious why those Fantastic Four issues with Thor's hammer were included but right now it doesn't make a whole lot of sense. A couple of people have recommended this series to me, and what I've seen so far has been worth reading."Mr. Parker Goes to Washington" was the best thing about this volume. I didn't think the Doombots/Thor story was necessary to the collection; but I'm the type of person who doesn't understand why the inscription on Thor's hammer is in English and not Runes...and I'm not a huge fan of the Fantastic Four. Ich habe noch überhaupt kein Gefühl dafür, wie ich Comics bewerten soll. Nun gut... Seit dem Civil War Film beschäftigt mich die Problematik, die dort angesprochen wird, und um ein bisschen mehr von den einzelnen Standpunkten zu erfahren, habe ich eine kleine Comicreise begonnen. In dem Band habe ich zumindest schon einige neue Ansichten gefunden, die mir helfen. Whatever. Lo mejor el especial de los illuminati. Los números de spiderman con iron man como invitado son bastante recomendables, sirven para dar trasfondo político y moral al evento y en conjunto explican el posicionamiento de Iron Man, los números de los cuatro fantásticos me parecen prescindibles, corrientuchos y muy predecibles, huelen a relleno que tiran para atrás. This is a good lead into Civil War (and Planet Hulk), as there's not a lot of action, but instead there's a good deal of buildup. Bendis is comfortable writing teams and dramatic dialogue, and this works like the majority of his work. The Superhero Registration Act is just insane. I mean, I understand WHY the government would want it, but I also understand why many of the heroes are against it. They need their privacy too. I'm dying to see what occurs next. This story was entertaining and provided a lot of good background info. However, it really isn't necessary at all to understanding what occurs in the civil war. So, basically what I've learned from this is that the entire Marvel Universe should listen to T'Challa. This book is sufficient to set in motion the events of Marvel's Civil War. I recommend that anyone interested in the main event read this first. A good lead up to Civil War.World: A lot of world building done here, the art is fine, I hate the Iron Spider suit but I know some people love it, I just don't. The stakes and the state of the MCU is laid out well here with the sides starting to form and the debate starting to happen. It's a good set up for the event.Story: The story is alright, mostly character moments and decisions and set up for the event. For the Peter story I liked the quiet moments such as him debating with the senate, it's heartfelt and really puts and core of the character into full display. It's nothing deep and new but it was good and does start drawing the line in the sand and getting ready for the event.Characters: It was done well, little quiet moments that define character to get them ready for the event, that's about it.It was what it was, a set up for Civil War. I don't like events but this road to was done relatively well.Onward to the next book!